If you recorded a video with your phone, the video may appear upside down or sideways when you upload it to YouTube. Here's how to rotate the video so that it plays right side up. 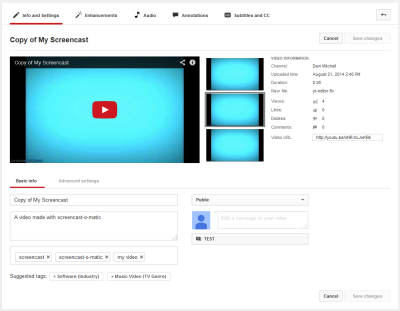 Step 1:Upload a video and navigate to the Edit Videos window. For instructions on how to upload or edit a video, visit the Upload Videos and Edit Videos articles. Step 2:Click on the Enhancements tab. Step 3:Select the rotate right or rotate left button to adjust your video. Step 4:Once you've fixed the orientation of your video, click Save. For an instructional video on how to edit YouTube videos, watch this Hoonuit video.